something the competition lacks. Find the value, find the customers. difference. 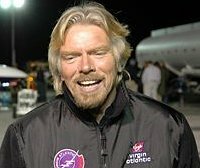 That’s the best reason to go into business because you feel strongly that you can change things,” says Branson. It’s the entrepreneurial passion and attitude that makes the difference in achieving lasting success. gut instincts to take advantage of opportunities when they presented themselves. Branson wasn’t born wealthy, and began his empire by selling yet-to-be touched (i.e. “Virgin”) records out of the trunk of his car when it was unheard of to do so. Slowly but surely, he built the expanded his business until it became the multi-billion dollar empire we know today. Mix a great idea with passion. Dad series, shares tips for getting ahead in business. Find equal opportunities. Don’t be a victim of the survival-of-the-fittest technique. Make yourself marketable. Get a life-changing business education. Feed your mental, emotional, physical and spiritual needs. No, this doesn’t necessarily mean sitting in a college classroom. Get an education from life. Latch onto friends who will pull you up, not push you down. Protect yourself from negative influences. Find value in your network. The more people you can meet in business, the better. Develop your most important business skill. Communicate, communicate and communicate. Be a leader. Influence others by being a great teacher. Don’t work just for money. Work to build wealth, not money. Invest. Live your dreams. First of all, make sure you have dreams. Then make them a reality. You can be a successful businessperson and still make your dreams come true. Don’t become discouraged when you start succeeding. Most of us accept the fact that failure brings problems. But sometimes we are surprised that success does too. As a result, it is easy for us to become ungrateful or cynical.